Perhaps the most important factor in making us feel festive is the music, and these last two weeks have been perfectly Christmassy for us in all the right ways. The children have sung their hearts out - at the Nativity in Kingston, in the carol service today, but also in the different villages. Not only that, but you might have been lucky enough to have heard our choir on the radio! We are very proud of our children, as I’m sure you are! It was lovely to hear so many positive comments from parents and members of the community. We have lots to look forward to next term as some really exciting things will be happening in both bases. You are, as always, welcome to join in the fun! We are especially looking for more parents to come and hear children read so if you are able to help do let us know. 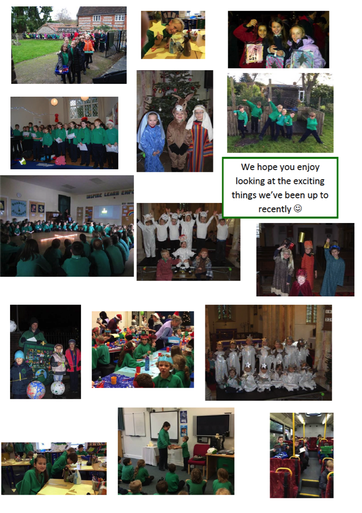 Have a peaceful Christmas break and we look forward to another wonderful year for 2016! As we’re getting ready to celebrate Christmas, don’t forget to reflect on the reason that we celebrate Christmas, Jesus, God’s gift to us.